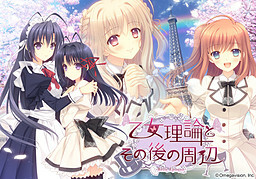 This is the fandisc for Otome Riron to Sono Shuuhen, which also requires you to have played the original title Tsuki ni Yorisou Otome no Sahou. It features after stories for Resona and Meryl, as well an another story and after story for Bluette. Hashimoto MiyukiInsert song "Dream Bridge"
"Senpai, the sight of your defenseless sleeping face made my maiden heart go pipipipipipi!"